This ebook contains excellent variety for magicians and mentalists of all performing capabilities and experience levels. The effects and routines include apparatus tricks, mental stunts, spirit writing, predictions, magazine and book tests, thumb ties, and tricks with cards, silks, coins, cigarettes, billiard balls, sponge ball and a terrific rope routine. "Choice stuff with lots of twists, variations and improvements. 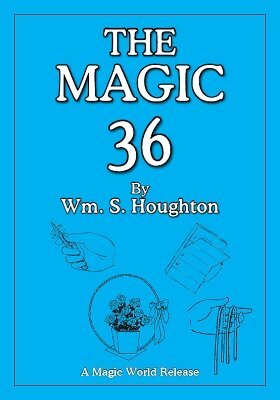 'The Magic 36' has great variety, no too-difficult sleights, and a number of individual items each worth a good price." - Lloyd E. Jones. "The book is particularly strong in mental effects although it covers a wide field, from sponge balls to coins to the production of a large basket of roses. Very much worthwhile and will be found most useful." - The Sphinx review. 1st edition 1943; digital edition 2017, PDF 134 pages.